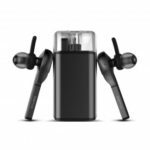 The true wireless design mini earbuds is great for running, jogging, hiking and other exercise. Ergonomic design provides long time comfortable wearing and securely fit to your ears. You can connect single earbuds or both sides with your cell phones. 600mAh charging box allows up to 4 hours music enjoyment and 100 hours of standby; with low battery warning and indicator, you’ll never worry about battery low. 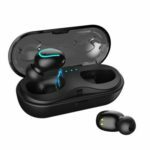 Built-in 55mAh battery (single earbud) with 600mAh large capacity charging box, the Bluetooth Earbuds allow seamless music enjoyment of music up to 4 hours on a single charge and 100 hours of standby. Put earbuds into the magnetic charger&apos;s charging prongs, earbuds will attach to it firmly. No longer worrying about charging cut off, greatly improved charging efficiency. 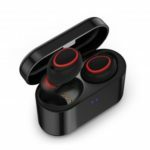 Adopts Bluetooth V4.2 technology, true wireless earbuds, no wires tangling. Support connecting with two devices simultaneously. There is reminding sound when battery is low, and the LED would flash in red at the same time. When taking charge, the LED would be in red, and turns in blue when fully charged. Also, battery status display supported on iOS devices. 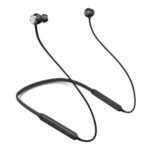 Connect single earbuds or both sides to mobile phones is at your choice. With built-in microphone, you can enjoy clear handsfree calling. 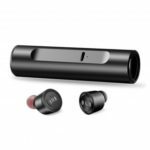 Compatible with most Bluetooth-enabled devices like Android Phones,iPhones, iPad, etc.